Sales came in down -1% and e-commerce up only +2.8% well below prior full-year double-digit growth expectations as expected. The company’s inability to drive top-line growth persists. Gross margins came in down -110bps compared to company guidance calling for flat to up slightly and even below our down -50bps expectations. Margin pressure is clearly underway. 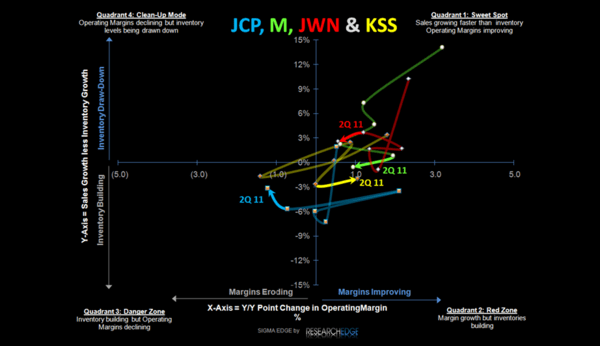 In addition, JWN just highlighted that they have yet to see a squeeze from inflationary pressure, which is right in-line with our call that JCP is the most exposed in this regard. Managing SG&A expenses is how the company ultimately got to its number. Expenses coming in down -2.5% compared to company expectations to increase “slightly,” saved the quarter from being a complete disaster. For reference, if the company maintained its investment schedule and increased SG&A by +1.5% as we expected, earnings would have come in NEGATIVE with EPS of ($0.01). Had JCP kept SG&A flat, EPS would have come in at $0.04. As we highlighted in our recent Black Book, the company has already cut expenses down to the bone. There simply isn’t much left for JCP to keep pulling from in an attempt to juice earnings on a go forward basis. As for guidance, the company guided Q3 to $0.15-$0.20, well below the street at $0.27E & they pulled full-year guidance altogether. The table below captures what the implied earnings would have to be in Q4 given 1H results and the high-end of Q3 guidance in order to achieve prior guidance of $2.15-$2.25 as well as where the full-year could shake our based on out and the Street’s expectations. In short, it’s not happening.